So I’ve heard things both wondrous and rather negative about this one. Seems that it’s either the best thing since sliced bread and worthy of the Oscar for best movie… or boring Disney-fied preachy pabulum for tree huggers who can’t think for themselves. 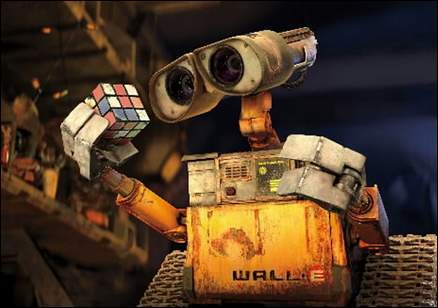 I’m not going to throw myself at Pixar’s feet and cry my eternal passion for their work, nor am I going to call WALL-E a masterpiece, but it’s a cool movie—for what it actually is: a love story. I think of the movie as a three parter. I positively love the beginning of the movie. 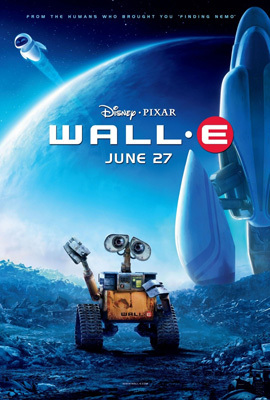 I saw a review somewhere last week, before watching the movie, wherein WALL-E was described as something like “Chaplin in space”—and I couldn’t help but agree. He’s alone and lonely. He’s curious and self-aware. He’s industrious and resourceful. He is the last active robot on earth. He has created a routine for himself which results in his building these really cool looking structures (between, around and on top of empty skyscrapers in what looks like New York City) out of compacted trash. Simultaneously, he forages for interesting bits and bobs, which he collects in a cooler and takes ‘home’ to examine and sort out. He has a pet cockroach, which he protects and feeds and cares for. His aching for interaction, for contact, is portrayed so vividly and so credibly, that for a while we forget this is a computer animated robot. In everything but structure, he’s human in the best sense of the word. In the second act, so to speak, a spaceship drops a probe robot near where WALL-E lives. This second robot, EVE (or, as WALL-E calls her, EVA) is light years ahead of WALL-E in terms of development and capabilities. She also has slight anger management issues… The phrase ‘hair trigger temper’ could have been created for her, what with her laser blaster and stuff. Obviously, it’s love at first shot for WALL-E.
Next is a very charming scene in WALL-E’s “home” wherein he tries to communicate with EVE, by sharing his treasures with her. Christmas lights. A light bulb. An old VHS of Hello, Dolly. A Rubik’s cube. A pile of cigarette lighters. A manual egg beater. At all these, EVE basically stares in confusion. Finally, WALL-E shows her something that triggers EVE’s program, which results in her transformation into an unresponsive piece of metal. The sequence that follows EVE’s shut down is almost sweet enough to make your teeth ache. WALL-E spends his days caring for her—protecting her from rain and snow, taking her out on strolls around the city, trying without success to ‘wake’ her. I don’t know about other viewers, but for me this sequence worked very, very well. There’s such poignancy in his single-minded caring for this other being, in his devotion and dedication to her. The next and final act is the weakest for me. When, an undetermined period of time later, he regretfully gives up and decides to go back to his pre-EVE routine, the ship returns, collecting EVE (as it had many other probes, we learn soon thereafter). A panicking WALL-E manages to hitch a ride, following his beloved to the starship where humanity has lived for the last 700 hundred years. From there, all sorts of cute hijinks ensue. There are chases, misfit robots, brave humans, and rogue computers—all followed by a predictable ending. But seriously, what would you expect from a Pixar/Disney movie? A philosophy debate? Solution to humanity’s problems? Actually, I think that one could get both from this one… if one is willing to look at the big picture beyond the inconsistencies necessary for the telling of what is, at heart, a love story. How could I forget the bubble wrap??????? Thanks for reviewing. Despite all the favorable reviews on this one, I’ve resisted seeing it because I don’t tend to like robots (or cars or any mechanical devices) as main characters. Give me good old toys as heroes any day. But your review has won me over. The movie “opens” at our little local theater this weekend (we get second runs only) and I’ll go down and watch it rather than waiting for DVD. Thanks for the review, azteclady! AL: I took my two little cousins and we had a ball. And I will not admit that I had tears running down my cheeks as the end credits rolled. 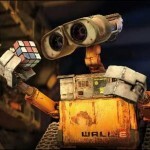 I believe WALL*E is the best Pixar movie ever and should be up for best picture of the year! I must be the only person on the face of this earth that didn’t like this movie. I fell asleep three different times and I wanted to leave about half way through the movie, I just didn’t want to see the rest of the movie. Didn’t do anything for me. But I’m glad that you liked it sweetie. I thought it was a really sweet movie that was fantastically animated. I also like its message and I left the theater feeling hopeful rather than beat down. While I really enjoyed this movie, I was a little disappointed that they used most of the best sight gags in the trailers/previews. Sort of took away the element of surprise.